Erich Honecker’s funeral in Santiago in 1993. His widow Margot stands with her hands folded. Margot Honecker, widow of the former East German leader Erich Honecker, died last week in Santiago, where the couple found a kind of refuge after the fall of the Berlin Wall. 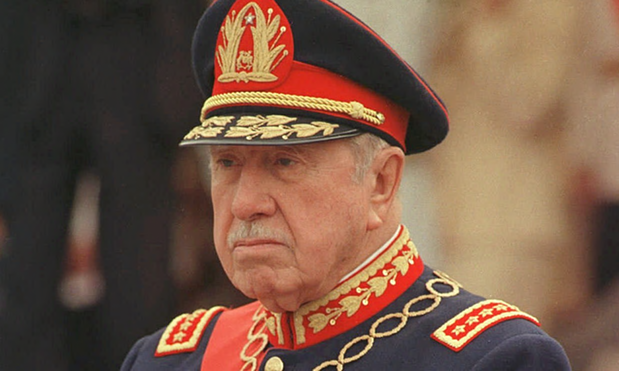 How this came to be is an interesting footnote to the Cold War, and has also spurred some debate in Chile over double standards when examining dictatorships. After the 1973 military coup, thousands of Chileans sought political asylum in other countries and a significant number ended up in what was then East Germany. These included future President Michele Bachelet and her mother, along with prominent members of Chile’s Socialist and Communist Parties. Fast forward to Christmas 1991, when Chile had returned to civilian rule and the Berlin Wall had collapsed: Erich Honecker, now wanted for embezzlement and the killing of nearly 200 people attempting to flee East Germany during his rule, arrived at the Chilean Embassy in Moscow. The Chilean ambassador was Clodomiro Almeyda, a Socialist and former exile who had lived in East Germany and become good friends with the Honeckers, whose daughter had married a Chilean. Honecker had not officially sought asylum, but was treated as a kind of guest while Chile’s new civilian government found itself entangled in a diplomatic and political quandary as it negotiated with Russian and German authorities. Chilean officials were divided as to whether Honecker should receive asylum in their country. Some members of the center-left coalition were strongly in favor, while others worried about what it would mean for Chile’s image if it were to protect a notorious human rights violator. Even some right wing politicians did not want to seem as submissive to Germany, which was making increasingly sharp demands for Honecker’s extradition. A year and a half later Honecker was finally escorted from the Chilean Embassy in Moscow and made to appear in a German court, after which German officials released him on grounds of his age and illness. So Erich and Margot Honecker lived rather quietly in Santiago until the former’s death in 1993. A few years later a correspondent for Chile’s El Mercurio newspaper visited the archive at the Stasi Museum in Berlin and was able to examine some of files collected on Chilean exiles living in East Germany during the Pinochet dictatorship. Some exiles were spied on by fellow exiles, who dutifully reported to East German officials and dossiers were compiled even on younger Chileans who had little political experience. The reports noted that many Chileans complained about the jobs they were assigned, and at least 21 Chilean exiles were deported from East Germany in 1974. “These are persons who cannot adjust to normal behavior in the RDA,” one of the files said. 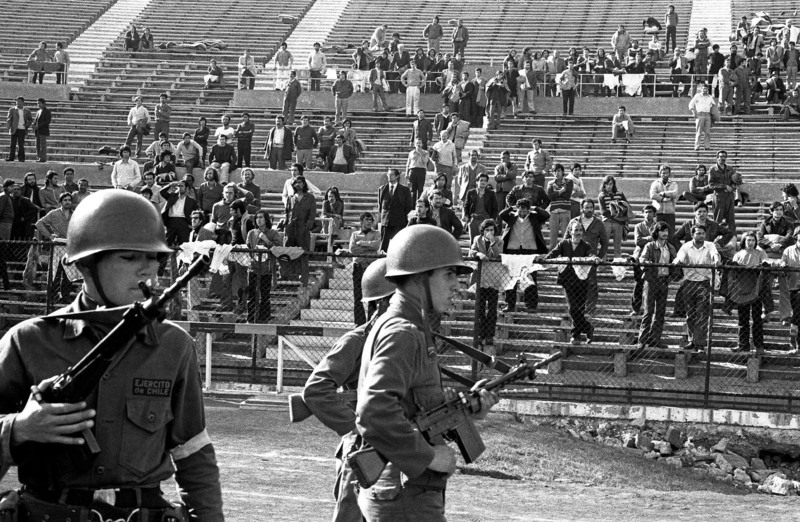 In response, a municipal official in the Santiago suburb of La Reina, where the Honeckers had been living, declared her persona non grata and said her comments “showed no respect for life” and that the Berlin Wall had been “a symbol of intolerance and authoritarianism.” The municipal official, Francisco Oleo, just happened to be a member of Chile’s Socialist Party. Friends reunited? 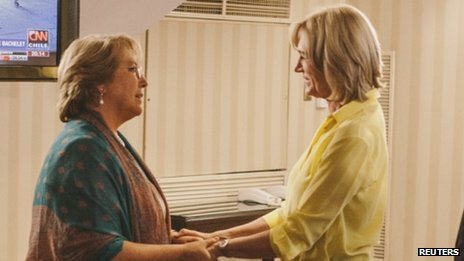 Michelle Bachelet is congratulated by her electoral opponent and childhood friend Evelyn Matthei on her victory in Sunday’s presidential runoff vote. It’s a shame the Chilean runoff election happened to take place on the same day as Nelson Mandela’s funeral. Michelle Bachelet won an easy victory over Evelyn Matthei, with an estimated 62 percent of the vote, and this will mark the first time since Chile’s return to democracy that a president will serve a second term. Now comes the hard part. The BBC’s Gideon Long reports that Chile’s Central Bank is warning that growth might drop to below 4 percent next year, as copper prices extend their recent decline http://www.bbc.co.uk/news/world-latin-america-25398021. Bachelet faces high expectations for education reform, but this will be costly and harder to bring off with lower export revenues.